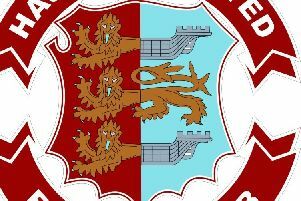 Hastings United’s footballers will tackle the early league leaders for the second time in a fortnight tonight (Tuesday). The U’s will travel to Folkestone Invicta in Ryman Football League Division One South, exactly two weeks on from their 4-1 defeat in the reverse fixture at The Pilot Field. On that occasion United had Sam Cole sent-off after the half time whistle when already trailing 1-0. Although Zac Attwood scored a brilliant equaliser, Folkestone netted three goals in 15 minutes to run out comfortable winners in the end. Eager to make up for the disappointment of play-off final defeats in the last two seasons, Folkestone have picked up 19 points from a possible 21 at the start of this term to lead the table by three points from Faversham Town. Sixth-placed United have started pretty well themselves with 12 points so far, although Saturday’s single goal defeat at home to Carshalton Athletic was a notable disappointment. United will naturally be keen to avoid back-to-back losses, but will have to do without Cole, who starts a three-match ban for his sending-off at home to Folkestone. The midfielder has scored five goals already this season. Kick-off at the Fullicks Stadium is 7.45pm. Ryman Division One South top 10 (all played 7 matches): 1 Folkestone Invicta 19pts (+11 goal difference), 2 Faversham Town 16 (+7), 3 Dorking Wanderers 15 (+12), 4 Corinthian-Casuals 13 (+5), 5 Ramsgate 13 (+2), 6 HASTINGS UNITED 12 (+7), 7 Herne Bay 12 (+4), 8 Worthing 12 (+3), 9 Sittingbourne 12 (-2), 10 Carshalton Athletic 12 (-2).